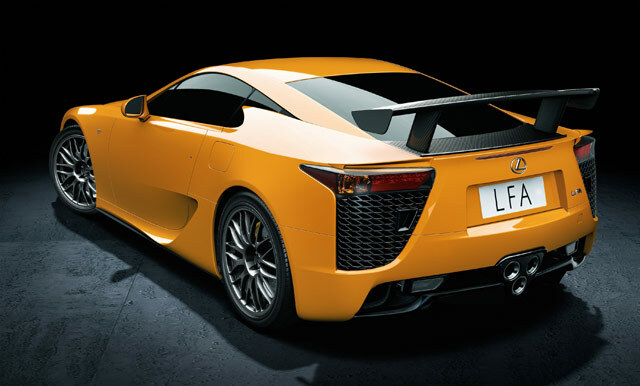 The Lexus LFA Nürburgring Package will make its official debut next month as part of Lexus’ display at the Geneva Motor Show. This amped-up $445,000 USD edition of the Lexus supercar will only be available on 50 of the 500 LFAs that are being built, and this exclusivity brings additional aerodynamic features and technical revisions to improve handling and downforce, increases engine output by 10bhp to 562bhp and speeds up gear shifts in the six-speed sequential transmission. The Geneva Motor Show opens on March 3rd. Unrelated note: Sorry if the site seems a little slow today — I’ve been linked to by Geenstijl.nl and my site is being bombarded with new visitors. Welkom op mijn nieuwe Nederlandse bezoekers!